vinyl flooring, an ideal combination of both style and function. The largest surfaces in your home -- your floors -- are transformed in a short time with our professional vinyl flooring installation. Our flooring showroom is stocked with countless styles that mimic the look of high-end materials like natural stone and tile. One of the most budget-friendly options for new flooring is vinyl plank flooring, which mimics hardwood. No matter the décor or furnishings you have in your home, there is a style available for you in our expansive showroom. Count on us for the best overall value when you’re looking for vinyl flooring in Lafayette, LA. Between our selections and commitment to customer service, you can expect an enjoyable experience and beautifully updated floors. Home and business owners receive excellent performance from vinyl flooring, due in large part to its unique composition and advancements in manufacturing. The base layer of vinyl tiles and planks is typically comprised of PVC. This gives it stability, rigidity, as well as resistance to moisture, making it a great choice for bathrooms, kitchens, and other rooms with lots of moisture. The image is then printed on top of the PVC, which is then protected by a clear film commonly referred to as the wear layer. The grade of this wear layer ranges from thin and economical to thick and commercial, with some floors lasting as long as 15 years or more. Even if you have small children or large dogs, you can expect years of performance from some of the most economical choices. The permeability of the wear layer provides an added benefit of soft, warm underfoot, softening impacts for unsteady toddlers or for people with stiff joints. Whether you choose vinyl sheet flooring, planks, or tiles, you will love how easy your new floor is to maintain. When you choose us to help you select and install your floors, we are happy to give you instructions for the proper care of the flooring. Cleaning the flooring is easy, and with the right methods, you can preserve the life of your floors for many years to come. Today’s advanced technology has made it possible for vinyl tile flooring to look like marble, granite, and travertine, it offers the elegance and appeal of high-end products, but without the extra maintenance and costs. Using an innovative process that produces a realistic three-dimensional photo that replicates natural materials, it’s hard to tell the difference between these floors and the real thing. The sale of vinyl plank flooring has dramatically increased because of its defining features and affordability. 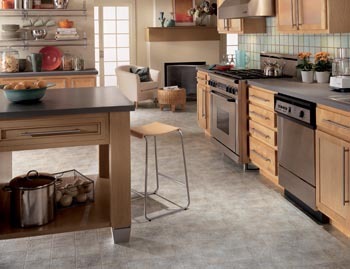 With its flexibility, style, and affordability, this flooring is an ideal fit for any space. This flooring mimics the appearance of hardwood, down to the grain patterns, whorls, and finishes. You can afford the stunning appeal of hardwood for a fraction of the cost when you choose vinyl planks for any room in your home or office. New floors are a big investment. And while vinyl floors tend to be relatively easy to install over other materials, there’s still plenty of room for error, including ordering too much, ordering too little, damaging walls or materials, and other costly mistakes. When you install new floors, it’s nice to have peace of mind that the job is done right the first time. You’ll want someone who can guarantee your satisfaction when you need vinyl flooring installation. Our flooring store is known for it's knowledgeable and friendly sales specialists as well as providing a complete customer experience. We employ a staff of licensed installers to ensure the success of our customers’ home improvement projects. When you hire our professionals for vinyl flooring installation, you can rest easy knowing that your floor is installed properly. You get an installation-related warranty, skilled workers, and efficient service. Count on our pros to take all the necessary steps to ensure quality workmanship. Because this flooring sits directly on the subfloor, our team will carefully assess your space. After preparation is completed, the installation will proceed with using proper techniques and professional-grade equipment. Expect your new floors to look and perform as they should when you trust your project to us. If there are ever any installation-related problems for as long as you own your floor, you can count on us to fix it at no cost to you. Contact us today to learn more about vinyl flooring and the options available in our showroom. Financing options available. We are happy to serve clients in the communities of Lafayette, Carencro, Youngsville, Broussard, Scott, LA, and the surrounding areas.